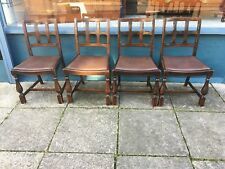 5 Oak Kitchen / Dining Chairs with wicker / rattan type bases. 4 x Sturdy Fiddleback Wheel Back Chairs. From Seat to Floor 17". Table will easily Seat 6. Item will be handed over as in Picture and can not be Boxed. Probably in Oak, they have Brown Faux Leather Seat Pads which are in good condition but easy to re-cover if preferred as they lift out. In addition the Carvers have sweeping scroll end arms on turned wood supports. Wear over the years has allowed the grain of the wood to show through giving a lovely authentic finish. Carvers are 56cm across the arms, 44cm across the front of the seats inside the arms, 114cm maximum height with the seats about 48cm high. There are lots of small scuffs and areas of wear to the finish so the lighter wood shows through. The red vinyl seat coverings are intact and the seats are supportive, if a little lumpy, but would be easy to re-cover as they just lift out. Here we have a set of 4 solid oak. H to seat: 46cm. In good condition for age. Collection in person only. No laminate, solid oak. Craftsman made. Beautiful Black Wrought Iron inserts to backs. Stunning chairs in very good used condition. Would go well with light oak or pine. Zone A & B. Cash on collection. PH42 to44, ZE, Isle of Man, Channel islands. The rounded edges of the chair gives the room an impressive country look that adds a rustic charm. Choose from four different Zelah range chairs (see our dining chair category and photos). Zelah Oak Cross Back Dining Chair with Solid Seat. S height 42 cm. width 54 cm. Probably dating from around the 1940s/50s, lovely design with carved turned wood front legs, traditional style 'H' shaped cross support and brown faux leather seat with hessian style webbing to the underside - lift out seat pad so easy to re-cover if preferred. This is for a Set of 3 Light Oak Windsor Style Kitchen/Dining Chairs. Collection from Bow, near Crediton, or Inwardleigh, nr Okehampton, Devon . Antique Oak Chair with Drop In Rush Seat. Primitive. Country Kitchen. E19thC? Apart from the two corner wedges referred to in the condition report all other repairs are well aged. see pictures. Primitive - great country kitchen style. Kitchen Chair. Hall Chair. Bedroom Chair. S height 46 cm. width 48 cm. Has a Padded Upholstered Seat decorated with a Wine Coloured Fabric with a repeating small Blue and White pattern. The Chair and its Upholstered Seat are in Very Good Condition. This is a Well Made Solid Oak Dining or Casual Use Chair. Nice backs with shaped central slat having carved feature in relief, top rail over.Turned wood front legs, traditional 'H' shaped cross support. General marks and knocks so could be ideal for a painting/upholstery project and would look great when done. Probably dating from around the 1940s/50s, lovely design with carved turned wood front legs, traditional style 'H' shaped cross supports and brown faux leather seats with hessian style webbing to the underside - lift out seat pads so easy to re-cover if preferred. White Lacquered Seat and Back with Oak Colour Finish Legs. This does not affect your statutory rights. Simple Self-Assembly Required. Changed your mind?. The slightly rounded edges of the chair gives the room an impressive country look that adds a rustic charm. Capri Oak Dining Chair. The slightly rounded edges of the chair gives the room an impressive country look that adds a rustic charm. Seat Height 18". All calls are recorded and monitored for quality and training purposes. Tables in particular will experience wear and tear due to the extensive use they receive. Add to Watchlist. Depth 21.5". Abbey Grande Dining Chair Add this exquisite dining chair to an existing dining table to freshen up your look. With a simple, clean lined design and lightly waxed finish this chair will work with a variety of decor. This Ladder back chair features a Light Lacquer wood and the padded seat area is comfortable as well as stylish. The Alba Oak range incorporates a beautiful collection of oak furniture with a light lacquer finish. Dining Chairs are finished in oak veneer and manufactured from solid rubberwood throughout and features synthetic leather seat pads in Brown. AB 10/11/12/15/16/24/25, EH, DD, DG, FK 1-18, G, KA 1-26, KY, ML, PA-1-19, PH 1-10, TD, AB 1-9, 13/14/21/22/23, 30-45, 1-56, IV 1-56, FK19-21, KW1-14, PA20-39, PH 11-40, BT, HS 1-9, KW 15-17, PA40-61, PH41-44, ZE 1-3, JE/GY, Eire, Dublin, Isle of Man, Offshore Scottish Islands. Add to Favourites. Width - 47cm. The rounded edges of the chair gives the room an impressive country look that adds a rustic charm. Choose from 4 different Zelah range chairs (see our dining chair category and photos). Zelah Oak Cross Back Dining Chair with Padded Seat. Feature 100% brand new top quality! Elegant, classic upholstered leisure chairs. Thanks to the thickly foam-padded seat and backrest, our chairs offer the utmost seating comfort. The high-quality oak frame and feet make the chairs sturdy and durable. Leisure Chairs is aesthetically and ergonomically designed to make a decorative as well as comfortable addition to your dining room. Product Dimension Colour: Grey and wooden Material: Metal legs high-quality fabric seat Overall size: (WxDxH) 37 x 44 x 86 cm, Height of seat: 47cm Material: Metal (legs); 100% polyester (cover) Suitable Places: Living Room, Bedroom, Leisure Areas, Hall, Hotel, Villa, Club Delivery Service · We only provide free delivery to UK mainland. The 'Richmond' range is a beautiful country inspired range hand painted in a striking on-trend slate grey-blue shade. Add to Favourites. Further Information. Width - 47cm. “ Antique Oak Ladder Back Kitchen, Dining, Salon or Bedroom Chair with a Rattan String Seat ”. Home Amparo Oak Effect Dining Table & 4 Chairs - Cream 1752. Matte finish table. Wood veneer finish. Upholstered finish. If for any unforeseen reason you are not satisfied with our product or service or for any other. With its satin lacquered finish and contemporary low back it is modern and stylish whilst still being resilient. Crafted from solid oak, solid wood and selected real oak veneers, this range is ideal for when space is at a premium. Striped Fabric Dining Chairs x 2. The Dining Chair is a contemporary chair with a stylish look. Wooden Legs. Striped Fabric. AB 10/11/12/15/16/24/25, EH, DD, DG, FK 1-18, G, KA 1-26, KY, ML, PA-1-19, PH 1-10, TD, AB 1-9, 13/14/21/22/23, 30-45, 1-56, IV 1-56, FK19-21, KW1-14, PA20-39, PH 11-40, BT, HS 1-9, KW 15-17, PA40-61, PH41-44, ZE 1-3, JE/GY, Eire, Dublin, Isle of Man, Offshore Scottish Islands. I would have listed it that way if that was my intent. I operate 9 to 5 from a Desk Top. You do not need to use this if you are coming 9 to 5. It's hard to beat a classic which is why we've designed this fantastic chair with a chic, retro look. Upholstered in grey fabric to be easily matched with any decor and finished with solid wooden legs, all it takes is 1 or more to complete the stylish look of your kitchen or dining area, it's even perfect for a stylish office solution. THESE ARE OAK DINING/KITCHEN CHAIR. VERY GOOD CONDITION, STRONG, TRADITIONAL STYLED SIDE CHAIR. IDEAL FOR A SHABBY CHIC COUNTRY KITCHEN. Dining Chairs are finished in oak veneer and manufactured from solid rubber wood throughout and features synthetic leather seat pads in Brown. AB 10/11/12/15/16/24/25, EH, DD, DG, FK 1-18, G, KA 1-26, KY, ML, PA-1-19, PH 1-10, TD, AB 1-9, 13/14/21/22/23, 30-45, 1-56, IV 1-56, FK19-21, KW1-14, PA20-39, PH 11-40, BT, HS 1-9, KW 15-17, PA40-61, PH41-44, ZE 1-3, JE/GY, Eire, Dublin, Isle of Man, Offshore Scottish Islands. This set consists of 2 dining chairs with armrests, upholstered in luxurious, high-quality fabric, is aesthetically and ergonomically designed to make a decorative as well as comfortable addition to your dining room. 2 x dining chair brie Holz oak solid Chair chairs kitchen Chair white Brown. 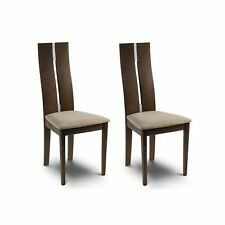 PKLine 2 x dining chair in oak kitchen chairs Chair group chairs.